I have been browsing eBay for a while now looking at trikes which are ready built and on the road, dreaming about what could be, when I came across an individual whom was selling an imported VW trike kit from J&S Hot Rod Asylum. This gave me the idea to build my own trike rather than buy an expensive one that may well have major issues. This is a very basic starter kit that can be enhanced by the builder to produce some pretty epic and unique designs. J & S Hotrod Asylum Basic Kit. So after buying this for £180, I needed a donor rear end from a beetle. 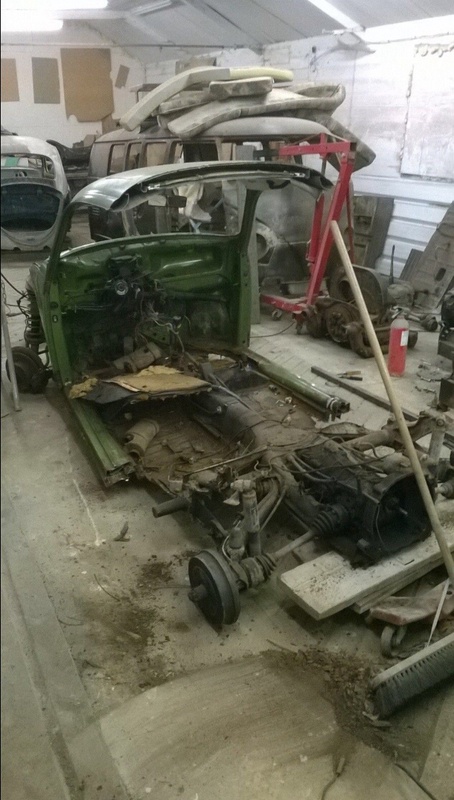 After a brief search, I came across a full beetle chassis with IRS suspension, a 1641cc gearbox, wheels, prop shafts, and suspension plus other body parts (which I don’t require for this project) and I proceeded to watch and keep an eye on till the end of the auction. Unfortunately I missed the date that it would finish, and realized that I would be sat in the middle of a field in Oxfordshire at a bike rally! Thankfully due to modern technology I was able to place a bid with 30 seconds to go and managed to win the back end I required for my project. I say back end, really it was more the case of the whole car sans interior and engine! Unfortunately all these bits where located through out the country, and I had to go collect them, which has resulted in my driving 700 miles in 13 hours, and I had to cut the back axle off the VW once I got to the second location. However after a very long day I seem to have the start of a very interesting trike, and I am looking forward to the build!